The site of Jericho, just north of the Dead Sea and due west of the Jordan River, is one of the oldest continuously lived-in cities in the world. The reason for this may be found in its Arabic name, Ārīḥā, which means fragrant; Jericho is a natural oasis in the desert where countless fresh water springs can be found. This resource, which drew its first visitors between 10,000 and 9000 B.C.E., still has descendants that live there today. 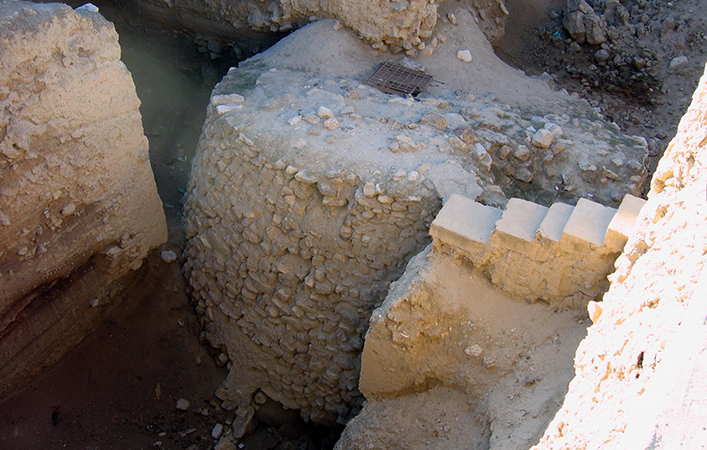 The site of Jericho is best known for its identity in the Bible and this has drawn pilgrims and explorers to it as early as the 4th century C.E. ; serious archaeological exploration didn’t begin until the latter half of the 19th century. What continues to draw archaeologists to Jericho today is the hope of finding some evidence of the warrior Joshua, who led the Israelites to an unlikely victory against the Canaanites (“the walls of the city fell when Joshua and his men marched around them blowing horns” Joshua 6:1-27). Although unequivocal evidence of Joshua himself has yet to be found, what has been uncovered are some 12,000 years of human activity. The most spectacular finds at Jericho, however, do not date to the time of Joshua, roughly the Bronze Age (3300-1200 B.C.E. ), but rather to the earliest part of the Neolithic era, before even the technology to make pottery had been discovered. 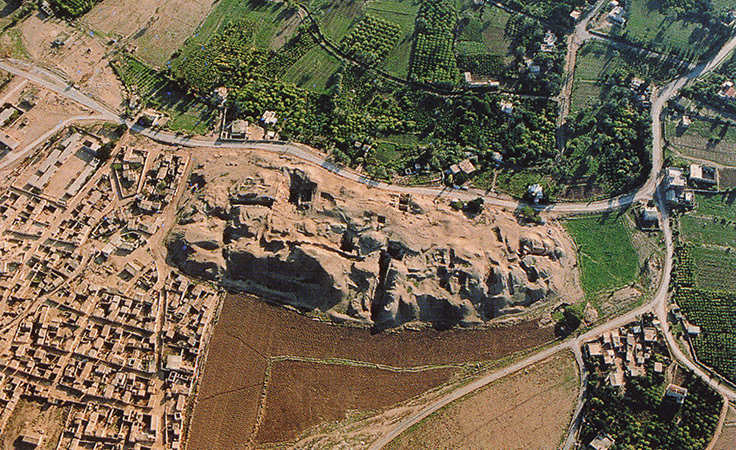 The site of Jericho rises above the wide plain of the Jordan Valley, its height the result of layer upon layer of human habitation, a formation called a Tell. The earliest visitors to the site who left remains (stone tools) came in the Mesolithic period (around 9000 B.C.E.) but the first settlement at the site, around the Ein as-Sultan spring, dates to the early Neolithic era, and these people, who built homes, grew plants, and kept animals, were among the earliest to do such anywhere in the world. Specifically, in the Pre-Pottery Neolithic A levels at Jericho (8500-7000 B.C.E.) archaeologists found remains of a very large settlement of circular homes made with mud brick and topped with domed roofs. As the name of this era implies, these early people at Jericho had not yet figured out how to make pottery, but they made vessels out of stone, wove cloth and for tools were trading for a particularly useful kind of stone, obsidian, from as far away as Çiftlik, in eastern Turkey. The settlement grew quickly and, for reasons unknown, the inhabitants soon constructed a substantial stone wall and exterior ditch around their town, complete with a stone tower almost eight meters high, set against the inner side of the wall. Theories as to the function of this wall range from military defense to keeping out animal predators to even combating the natural rising of the level of the ground surrounding the settlement. However, regardless of its original use, here we have the first version of the walls Joshua so ably conquered some six thousand years later. The Pre-Pottery Neolithic A period is followed by the Pre-Pottery Neolithic B (7000-5200 BCE), which was different from its predecessor in important ways. Houses in this era were uniformly rectangular and constructed with a new kind of rectangular mud bricks which were decorated with herringbone thumb impressions, and always laid lengthwise in thick mud mortar. This mortar, like a plaster, was also used to create a smooth surface on the interior walls, extending down across the floors as well. In this period there is some strong evidence for cult or religious belief at Jericho. Archaeologists discovered one uniquely large building dating to the period with unique series of plastered interior pits and basins as well as domed adjoining structures and it is thought this was for ceremonial use. Other possible evidence of cult practice was discovered in several homes of the Pre-Pottery Neolithic town, in the form of plastered human skulls which were molded over to resemble living heads. Shells were used for eyes and traces of paint revealed that skin and hair were also included in the representations. The largest group found together were nine examples, buried in the fill below the plastered floor of one house. 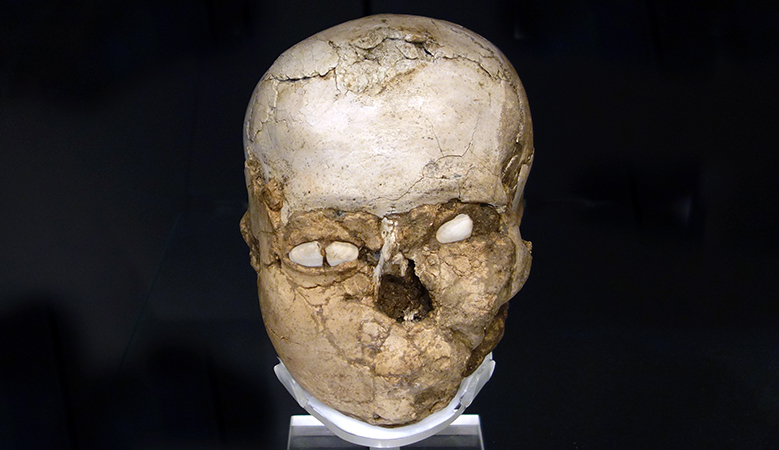 Jericho isn’t the only site at which plastered skulls have been found in Pre-Pottery Neolithic B levels; they have also been found at Tell Ramad, Beisamoun, Kfar Hahoresh, ‘Ain Ghazal and Nahal Hemar. Among the some sixty-two skulls discovered among these sites, we know that older and younger men as well as women and children are represented, which poses interesting questions as to their meaning. Were they focal points in ancestor worship, as was originally thought, or did they function as images by which deceased family members could be remembered? As we are without any written record of the belief system practiced in the Neolithic period in the area, we will never know. Cite this page as: Dr. Senta German, "Jericho," in Smarthistory, August 8, 2015, accessed April 19, 2019, https://smarthistory.org/jericho/.